Statistics report that for many, blue is our favourite colour. It’s history is full of dark tales, misappropriations and scientific advancements. This colour and all its variations has held a currency throughout time that we continue to chase it. It’s power lies in its unattainability. Why can’t we collect the blue from the sky or the sea? Why is it so beautiful but always feels like it is just beyond our reach? This is the magic of blue. Since the very first time we looked up into the ‘big blue’ it has carried with it the mysteries of the world and beyond. Discovering just where blue has been and where it’s going takes a long journey. 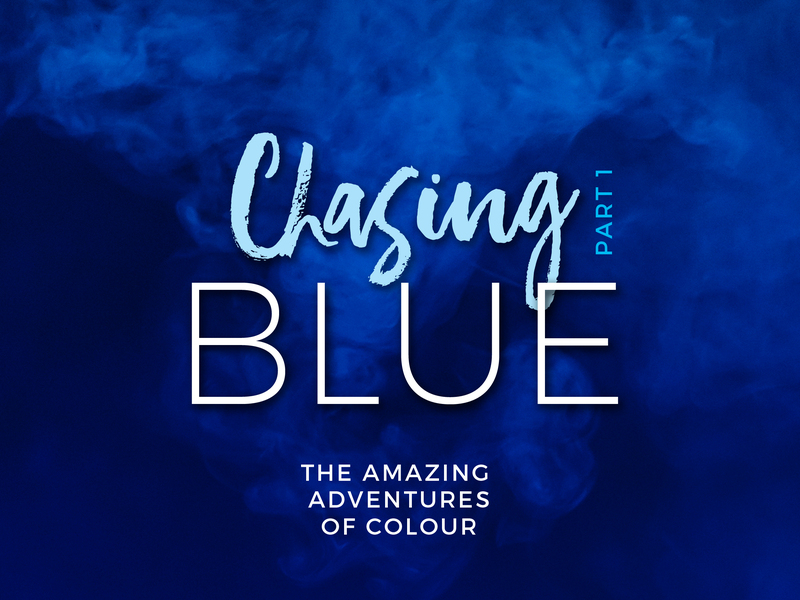 Here is Part 1 of Chasing Blue. Can you see it if you can’t name it? Many ancient languages never had a word for blue — not Greek, not Chinese, not Japanese, not Hebrew. And without a word for the colour, there’s evidence that they may not have seen it at all. In the Odyssey, Homer famously describes the “wine-dark sea.” But why “wine-dark” and not deep blue or green? Scholars trailing through Icelandic sagas, the Koran, ancient Chinese stories, and an ancient Hebrew version of the Bible have found no description for blue or anything that describes the sky as blue. Philologist Lazarus Geiger, sought out to uncover when “blue” started to appear in languages and found an odd pattern all over the world. Every language first had a word for black and for white, or dark and light. The next word for a colour to come into existence — in every language studied around the world — was red, the colour of blood and wine. After red, historically, yellow appears, and later, green (though in a couple of languages, yellow and green switch places). The last of these colours to appear in every language is blue. The only ancient culture to develop a word for blue was the Egyptians — and as it happens, they were also the only culture that had a way to produce it. Why the Romans should have taken notes! Hippopotame (Hippopotamus) , c. 3800-1700 BC (Left). “Egyptian blue” tripodic goblet, imitating lapis lazuli (right). 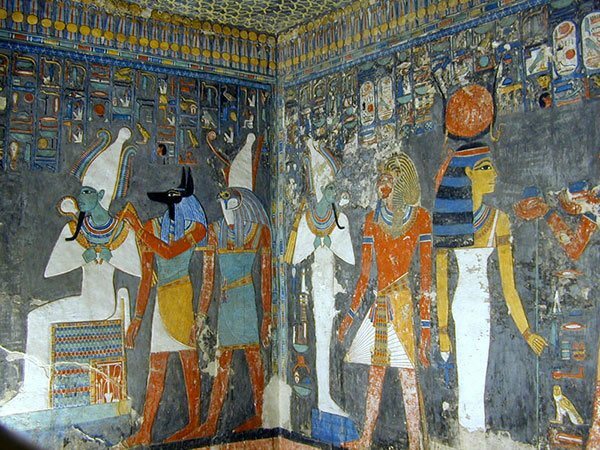 The ancient Egyptians were the only early culture with a word for Blue. Many other cultures preferred to name their colour by shade, rather than hue. Unlike many other ancient pigments, Egyptian blue is not a natural pigment. It does not come from grinding a rock like many of the other ancient colours. It was invented in Ancient Egypt around 2,200 B.C. It was made by combining limestone and sand with a copper – containing mineral (such as azurite or malachite. The solution that was then heated to between 1470º and 1650º Fahrenheit. The end result was an opaque blue glass, which was then crushed and ground into a powdered pigment. When combined with egg whites, glues, or gums, it transformed into a long-lasting paint or ceramic glaze. The process was a delicate one, any mistake would result in a “glassy, green mess,” explains Victoria Finlay in The Brilliant History of Colour in Art (2014). While Egyptian blue remained popular throughout the Roman Empire, its complex method of production was forgotten as new blues came to market. Egyptian blue remained popular throughout the Roman Empire, but soon other colours became more popular. The complex method of production was forgotten as new blues came to market (Ultramarine). The only mention of the pigment was found in the notes by philosopher Theophrastos in the 4th Century BC, 1900 years after it was invented. Fast track to 2006, conservation scientist Giovanni Verri made an accidental find that brought Egyptian blue back to the fore. Viewing a 2,500 year old Greek marble basin under fluorescent lights, Verri was surprised to find that the vessel’s blue pigments began to glow — confirming that Egyptian blue emits infrared radiation. This rare property enables scientists to find traces of the colour in ancient artifacts, even after the pigment has been washed away or otherwise made invisible to the naked eye. Egyptian blue is chemically stable in all media and absolutely light fast. ThIs process of searching for the colour on ancient antiquities is completely non invasive and has confirmed the discovery that most ancient Egyptian, Greek and roman sculptures were completely painted in colourful hues and never left bare showing the white marble that we see them as today. The unique properties found in Egyptian Blue have allowed scientists outside of the field of conservation to adopting the pigment for biomedical analyses and laser development. Technological discovery reveals that ancient sculptures were not left as white marble but all brightly painted. The world’s first artificial pigment, Egyptian blue, may help scientists prevent forgery and even save lives. Azurite with Malachite Nodule: A specimen of nodular azurite sawn and polished to reveal its beautiful blue structures (left). Ground azurite for use as a pigment (right). Azurite is a basic copper mineral. It comes in a range of deep blue to violet-blue colours. The blue colour, known as “azure,” is referred to shades of deep blue evening skies. It was used as an ore, a pigment, and a gemstone. As a pigment (ground), Azurite is unstable in air and water. Heat affects it too and it loses its colour when subjected to these elements. Its softness and tendency to lose its deep blue colour as it weathers limits its use. 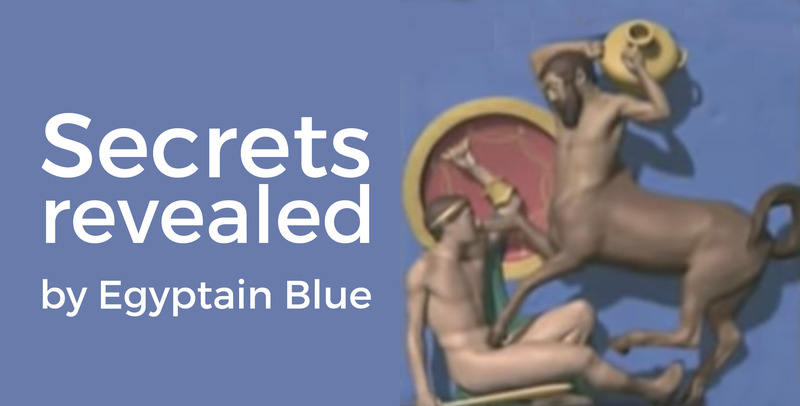 It was known to the Greeks and Romans but rarely used in painting for Egyptian blue was far superior option for both its colour and longevity. Valued for its gemological properties it is used occasionally as beads for jewellery, and as an ornamental stone. All of which are claimed to have mystical properties that enhance creativity and inner wisdom. 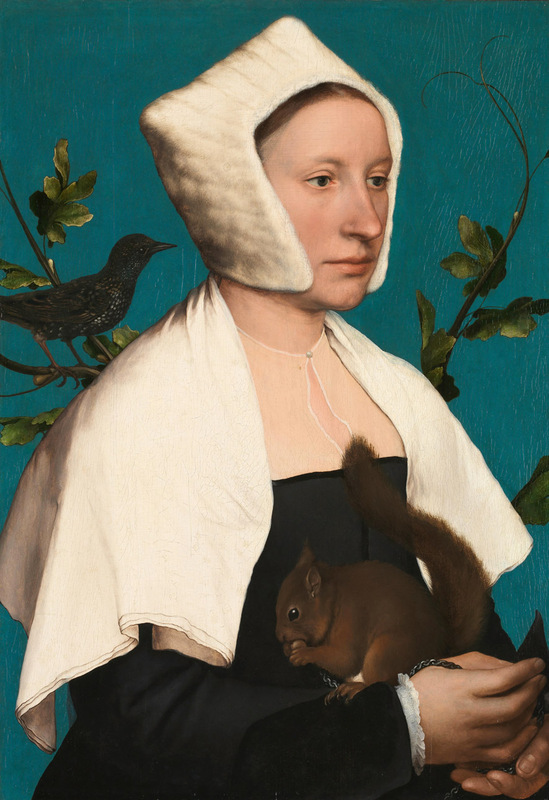 The background of Lady with a Squirrel by Hans Holbein the Younger was painted with Azurite. Egyptian Blue (CaCuSi4O10, left), Han Blue (BaCuSi4O10, centre) and Han Purple (BaCuSi2O6, right). Han blue (sometimes called Han purple) are synthetic barium copper silicate pigments that were developed in China. Used in ancient and imperial China from the Western Zhou period (1045–771 BC) until the end of the Han dynasty (circa 220 AD). 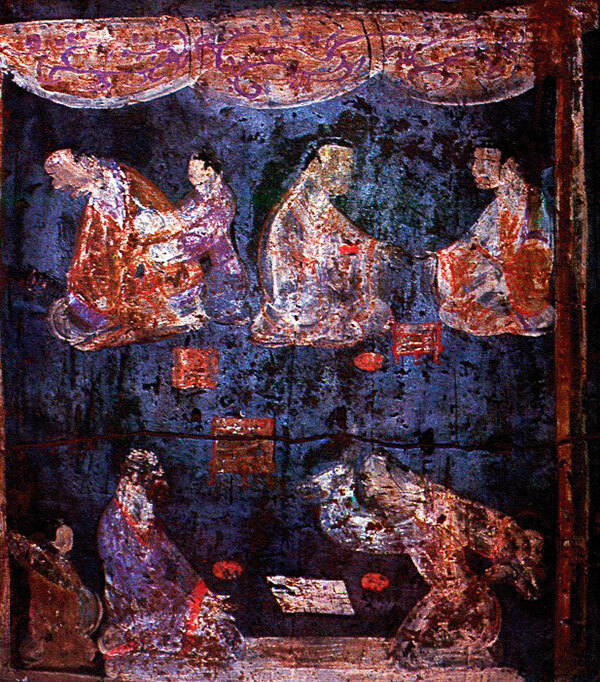 Detail of a mural from an Eastern Han tomb near Luoyang, between 25 and 220 A.D.
Han blue in its pure form is, as the name suggests, blue. Han purple in its pure form is actually a dark blue, that is close to electric indigo. Han purple gets its name from the colloquial English term referring to a colour between red and blue. It is not, however, a purple in the way the term is used in colour theory. A more accurate label would be to call it ‘Han indigo’, although it could also be regarded as a bright shade of ultramarine (classifying ultramarine as a colour and not a pigment). Han Blue has a high stability, resistant to high temperatures and light fast. The production of the pigment, sometimes labelled Chinese purple, dates back as far as 800 BC, but was not used in art until the Qin and Han dynasties (221 BC – 220 AD), when it was applied to the world famous terracotta warriors surrounding the tomb of the first emperor of China , as well as wall paintings ceramics, metal ware, and jewellery. 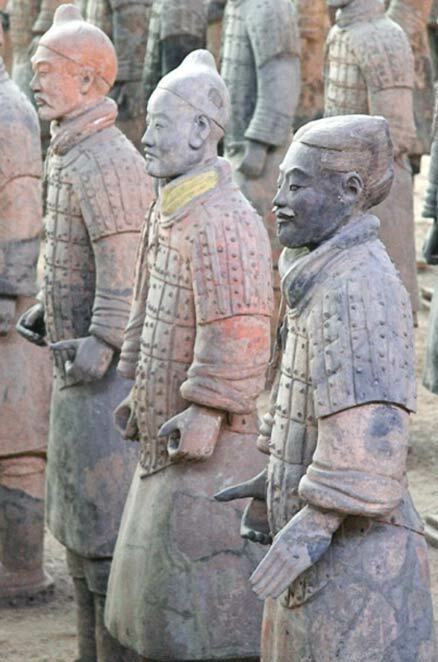 Traces of Han purple can still be seen on many of the terracotta warriors. The only two other man-made blue or purple pigments are known to have existed in the ancient world – Maya blue (from c. 800 AD), made from a heated mixture of indigo and white clay, and Egyptian blue, which was used throughout the Mediterranean and the Near and Middle East from 3,600 BC to the end of the Roman Empire. 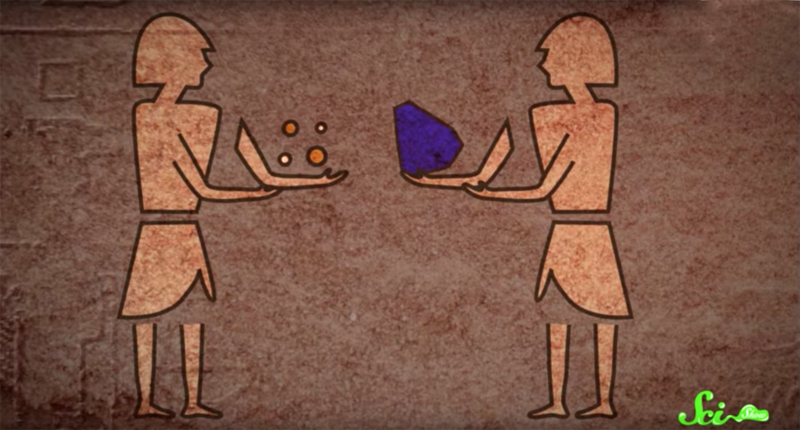 The similarities between Han purple and Egyptian blue led some early researchers to conclude that the Chinese may have learned to make the pigment from the Egyptians. However, this theory has been largely discounted as Egyptian blue was not found further East than Persia. The composition of Han purple differs from Egyptian blue only in the use of barium instead of calcium. “There is no clear reason why the Chinese, if they had learned the Egyptian formula, would have replaced calcium with barium, which necessitates increasing the firing temperature by 100 degrees or more,” Scientist Elisabeth FitzHugh explains. A team of Stanford physicists proposed that Han purple was a by-product of the glass-making process, as both glass and the purple pigment contain silica and barium. The barium makes glass shinier and cloudy, which means this pigment could be the work of early alchemists trying to synthesize white jade. But the colour disappears after 220 A.D. Scientists are yet to discover to the reasons for why did the pigment disappear entirely at the end of the Han Dynasty? What they have discovered is that the pigment is a technological wonder, made through a complex process of grinding up raw materials in precise proportions and heating to incredible temperatures. So intricate was the process, that it was not reconstructed again until 1992, when chemists were finally able to identify its composition. Since its composition was first discovered, scientists have continued to investigate this unique pigment. Researchers at the British Museum discovered that, when exposed to a simple LED flashlight, Han blue emits powerful rays of light in the near-infrared range. They discovered that the pigments show up with startling clarity under the right conditions, meaning that even faint traces of the colour, invisible to the naked eye, can be seen with infrared sensors. They also discovered that when exposed to extreme cold and a high magnetic field, the chemical structure of the pigment enters a new state called the quantum critical point, in which three-dimension material ‘loses’ a dimension. It is able to collapse three dimensions down to two under the right conditions. Why going blue would mean the death of you! Maya blue is a unique bright azure blue pigment manufactured by cultures of pre-Columbian Mesoamerica, such as the Maya and Aztec. 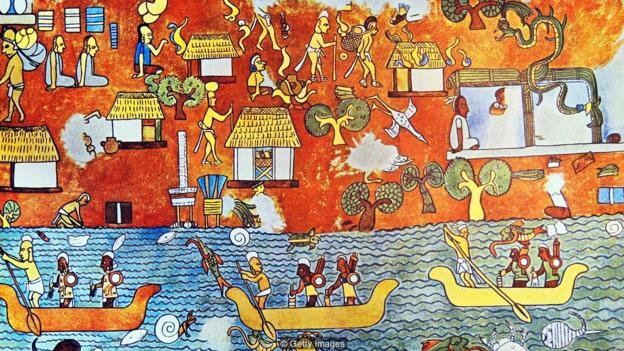 It has been found on pottery, murals and other artifacts produced by the Maya people of Central America centuries ago. That it can be found so long after its application indicates that was a highly durable pigment. In Mayan culture, this blue was also the colour of Chaak, the rain god, and of human sacrifice. When the skies looked too much like Maya blue — cloudless and dry — the Maya sometimes selected an unlucky victim to be painted this colour and sacrificed to Chaak in hopes that the rains would follow. An account by a 16th century Spanish priest described rituals where victims were stripped, painted and thrown onto a stone altar where their hearts, still beating, were cut out. This takes ‘feeling blue’ to a whole new level! Thankfully human sacrifice was not always part of the ritual, more often, pottery painted blue was thrown in, not people. The composition of Maya blue, first used around A.D. 300 and which is almost impervious to age, acid, weather and even modern solvents. Archaeologists studying pre-Hispanic Mesoamerican ruins also discovered blue murals in the Maya Riviera, modern day Mexico and Guatemala, from as early as 300 AD, perhaps the most famous being the murals at the temple of Chichén Itzá (created around 450 AD). The resilience of the blue in the murals was evident. They knew the añil plant, part of the indigo family, was widely available in the region at the time but that it was mostly used for dyes rather than paint. Indigo fades in the sunlight and natural elements, so they eliminated the idea that the colour was indigo. The chemistry of the colour remained a mystery until the 1960s, when chemists deciphered its components: the dye indigo and a clay mineral known as palygorskite, which can be melded together by heat to produce the pigment. 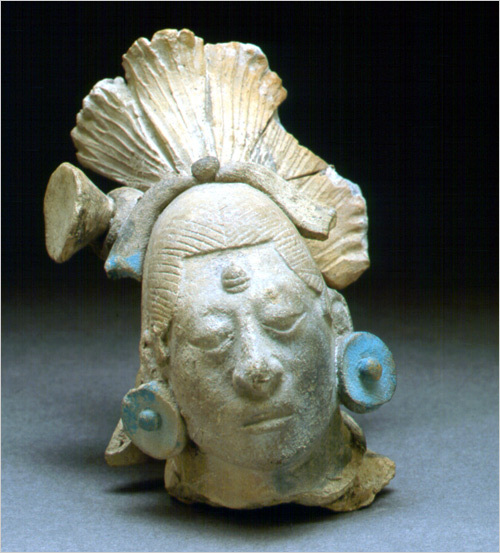 What was still unknown was where and when the Maya made Maya blue. The answer come from a bowl that had been sitting in the Field Museum in Chicago for decades. The bowl had been dredged up, among other artifacts and 127 skeletons, by an explorer named Edward Thompson early in the 20th century from a natural well at Chichen Itza, a major Maya city near the northern tip of Mexico’s Yucatan peninsula, about 120 miles west of Cancun. Thompson shipped the artifacts to Harvard’s Peabody Museum, which later gave some of them to the Field Museum. Three legged Mayan bowl. 600 – 900 AD. The three-legged bowl, dating from about 1400, contained a chunk of incense that was burned in Maya rituals. Within the incense were bits of white and blue. Molecular-scale images taken by a scanning, tunnelling microscope showed these to be palygroskite and indigo. Researchers were able to concluded, that the blue was made as part of the ritual, the ingredients heated by the burning of incense. The pigment was then applied to pots and sacrifices before being thrown into the well. Because the paint did not have time to set, the researchers surmise that the paint that washed off and tinted the sediment layer. As with most cultural invasions during colonization, Maya blue and cochineal were exploited along many other resources of the land and its people in the New World. The colours, that once represented the wealth of the Maya empire, would stand as a symbol of all that would be plundered and lost. There is little documentation of Master painters from the Americas but painters born in Mexico City, such as Juárez and Echave Ibia, departed from European aesthetics, and arrived to something uniquely layered: enormous and sophisticated compositions that drew upon the full vibrancy of the New World. At Mexico’s National Art Museum (Munal) in Mexico City, works by Juárez seen chronologically show his development from a European impersonator to a New Spanish Baroque master. 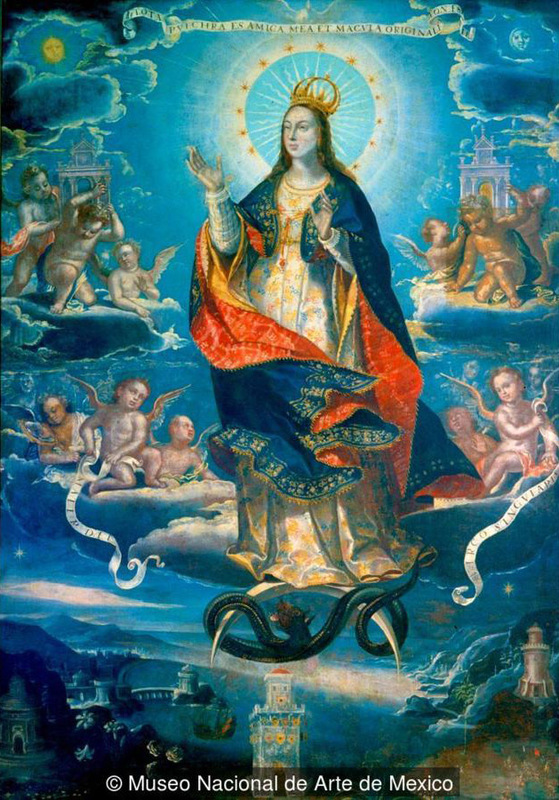 His early canvases departed from the dramatic spotlighting and warmth of European Baroque imagery and later moved into vibrant saturated colour throughout the picture plane thanks to the use of local materials such as Maya blue. This Baltasar de Echave Ibia work is practically soaked in blue – a luxury European painters of the 1600s couldn’t have afforded (Credit: Museo Nacional de Arte de Mexico). VIDEO > Why is the sky blue? As sunlight passes through the atmosphere, particles in the air scatter blue light more efficiently than any other colour in the light spectrum, creating a blue sky. Learn more about the sky and light in this video. 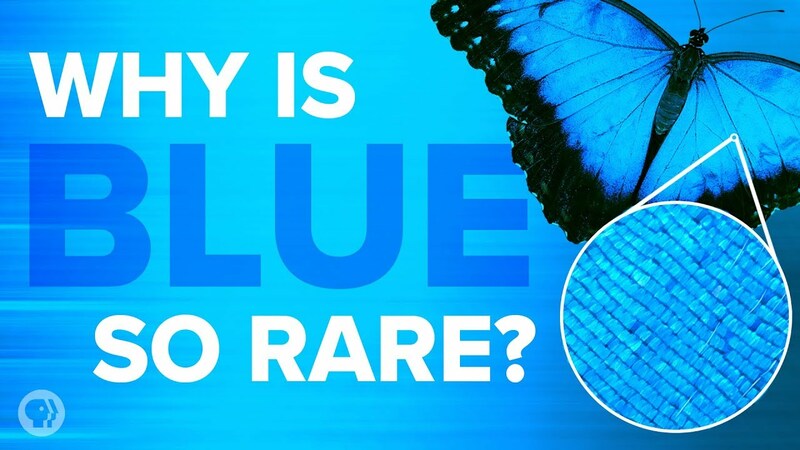 VIDEO > Why Is Blue So Rare In Nature? Among living things, the colour blue is oddly rare. Blue rocks, blue sky, blue water, sure. But blue animals? They are few and far between. In this video, we’ll look at some very cool butterflies with Bob Robbins, Ph.D. from Smithsonian’s National Museum of Natural History to help us learn how living things make blue, and why this beautiful hue is so rare in nature. Why Blues music is called the ‘Blues’? The name of this music is thought to have originated from the 17th century English expression “the blue devils,” for the intense visual hallucinations that can accompany severe alcohol withdrawal. Shortened over time to “the blues,” it came to identify a state of agitation or depression. “Blue” was slang for “drunk” by the 1800s. The link between “blue” and drinking is also indicated by “blue laws” that still prohibit Sunday alcohol sales in some American states. By the turn of the century, a couple’s dance that involved slowly grinding the hips together called “the blues” or “the slow drag” was popular in Southern American juke joints. A rural juke would be jammed on weekends with couples getting their drink on, doing the pre-coital shuffle to the accompaniment of a “bluesman” on guitar. The singing and drumming tunes sung by the slaves was far more sophisticated than colonial slave-owners understood. The African slaves used vibrato, tremolo, falsetto, overtones, hoarse-voiced and shouting vocal techniques to convey many shades of meaning. African musicians were also more advanced in polyphonic, contrapuntal rhythms than their European peers. The typical three-line blues verse we know of today emerged from call-and-response songs made up by slaves in the fields. West Africans working American fields improvised songs to the rhythm of the task at hand. The lead singer repeated a line twice to give another singer time to improvise a response. Colonists has no comprehension that many of the African languages were tonal, drummers could mimic speech. “Talking drums” were key to organising slave rebellions. They were banned once slave-owners caught on after several deadly uprisings. Brutal slave codes were inducted like the Black Codes of Georgia that enforced punishment by death for “beating the drum and blowing the trumpet”. How the mother of Christ rules with blue, the dark history of Indigo and why the Irish should be never be green. 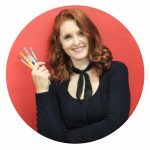 This blog focuses on one of my great passions … colour. I will bring you tall tales and tidbits about the origins and uses of colour and how it impacts our world. Colour has held many great powers throughout the ages. It plays many a leading role throughout history. It has been a killer, a saviour and a revolution maker. I thank the pioneers of colour who continue to pursue inventive ways for how colour can improve our lives. It is because of them that we can all be Colour Warriors and stay bright beyond beige. 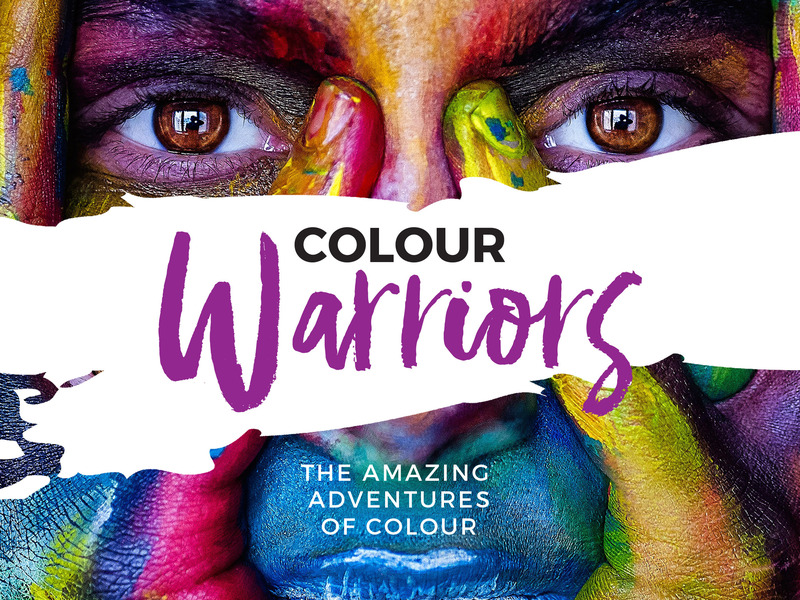 Thanks for joining me on the amazing adventures of colour!